Product code: ES8352 Categories: Art Deco, Art Deco Rings & Art Deco Engagement Rings. 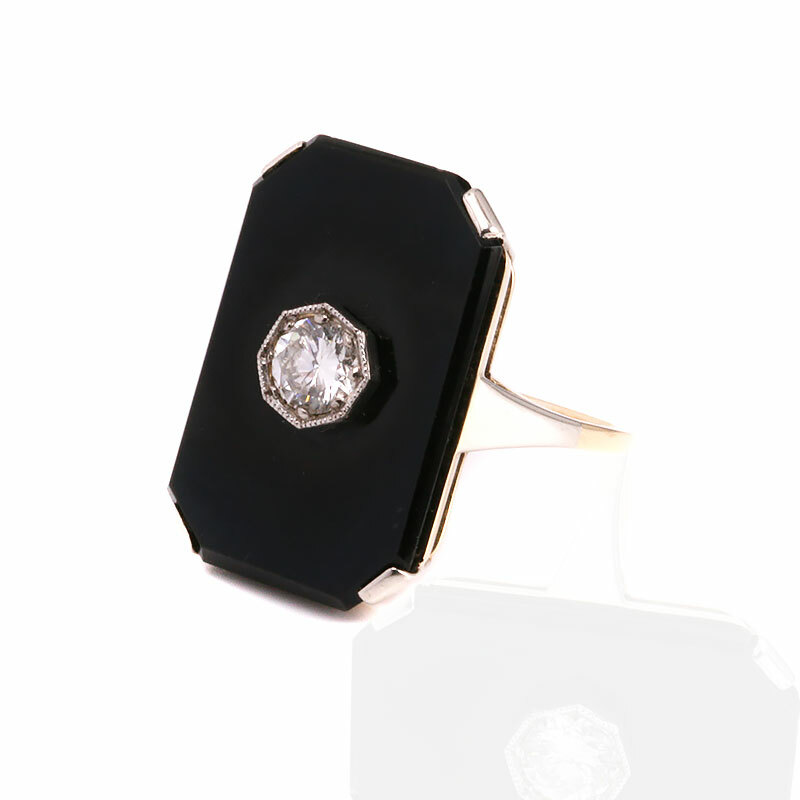 Black and white works so well as can be seen in this genuine Art Deco onyx and diamond plaque ring from the 1920’s. With the wonderful emerald cut black onyx measuring 14.4mm across by 22.1mm, the claws as well as the shoulders of this ring are in platinum which is a lovely pure white colour that looks brilliant holding onto the onyx. And then in the centre is another feature often found in Art Deco jewellery – a shape in a shape concept. Here there is a round diamond that measures 0.45 carats, yet it is bezel set in an octagonal setting. And then not only is it bezel set, but it has a millgrain finish which can be seen as the elegant crimping along the edge of the setting which was also popular during the Art Deco era of the 1920’s to the 1940’s. With an elegant band and a wonderful sleek look highlighted with the diamond sitting proudly in the centre, this is a perfect example of an Art Deco ring that will always look so elegant no matter where ever and whenever it is worn. This Art Deco onyx and diamond was hand made in 18 carat yellow gold and platinum. Jewellery of the 1920’s to the 1940’s Art Deco era, often incorporated the black and white look from the black onyx and pure white from the platinum. With the diamond millgrain set, this too was a popular technique often seen in Art Deco jewellery.